It's been awhile since I posted but also since I've done a Book of the Month post. This month I have two great books to tell you about: Hissing Cousins by Marc Peyser and Timothy Dwyer and Model Woman by Robert Lacey. 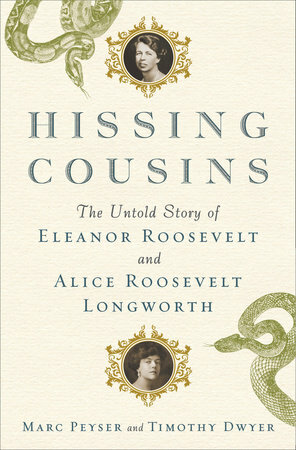 Hissing Cousins was published by Penguin Random House at the end of March. I've slowly been dipping into the book thanks to Net Galley. If you watched the recent Ken Burns documentary on The Roosevelts on PBS than you will definitely want to read this book. It gives the readers a more upclose and personal view on the relationship between Eleanor and Alice and also the dynamics between the Oyster Bay Roosevelts and the Hyde Park Roosevelts. ABOUT HISSING COUSINS: A lively and provocative double biography of first cousins Eleanor Roosevelt and Alice Roosevelt Longworth, two extraordinary women whose tangled lives provide a sweeping look at the twentieth century. When Theodore Roosevelt became president in 1901, his beautiful and flamboyant daughter was transformed into “Princess Alice,” arguably the century’s first global celebrity. Thirty-two years later, her first cousin Eleanor moved into the White House as First Lady. Born eight months and twenty blocks apart from each other in New York City, Eleanor and Alice spent a large part of their childhoods together and were far more alike than most historians acknowledge. But their politics and temperaments couldn’t have been more distinct. Do-gooder Eleanor was committed to social justice but hated the limelight; acid-tongued Alice, who became the wife of philandering Republican congressman Nicholas Longworth, was an opponent of big government who gained notoriety for her cutting remarks (she famously quipped that dour President Coolidge “looked like he was weaned on a pickle”). While Eleanor revolutionized the role of First Lady with her outspoken passion for human rights, Alice made the most of her insider connections to influence politics, including doing as much to defeat the League of Nations as anyone in elective office. My second book of the month is Model Woman by Robert Lacey. Back in olden times, also known as the 20th century, Michael Gross wrote a revealing book about the modeling industry called appropriately enough MODEL which detailed the history from its infancy all the way through the then crop of supermodels. Robert Lacey deals in depth with the woman who really changed everything for the better and the worst, Eileen Ford. This book is not a salacious biography along the lines of say someone like Kitty Kelley or Jerry Oppenheimer. This is a very even-handed biography of a very interesting woman. Eileen Ford, working with her husband, Jerry, created the twentieth century's largest and most successful modeling agency, representing some of the fashion world's most famous names—Suzy Parker, Carmen Dell'Orefice, Lauren Hutton, Rene Russo, Christie Brinkley, Jerry Hall, Christy Turlington, and Naomi Campbell. Her relentless ambition turned the business of modeling into one of the most glamorous and desired professions, helping to convert her stable of beautiful faces into millionaire superstars. Model Woman chronicles the Ford Modeling Agency's meteoric rise to the top of the fashion and beauty business, and paints a vibrant portrait of the uncompromising woman at its helm in all her glittering, tyrannical brilliance. Outspoken and controversial, Ford was never afraid to offend in defense of her stringent standards. When she chose, she could deliver hauteur in the grand tradition of fashion's battle-axes, from Coco Chanel to Diana Vreeland—just ask John Casablancas or Janice Dickinson. But she was also a shrewd businesswoman with a keen eye for talent and a passion for serving her clients.